recently introduced me to the meals in a bowl concept and we swap recipes and techniques. She is a working girl and does most of the cooking a week at a time on Sundays and will text me a shot of what’s in her wok. I work out of the house and have the option of cooking most evenings, so I’ll let her know what I’m putting together if I feel that it it’s something she might try. A few months back I purchased a Spiralizer and sent her one as a gift, and we’ve both been experimenting! One of my favorite side dishes these days are the “zoodles” that you can easily make with a Spiralizer and the more that I use it I find new ways to incorporate veggie yumminess into each meal. Back to the meal in a bowl concept, we love to eat this way mostly at dinner time and I haven’t really thought about it much for breakfast. 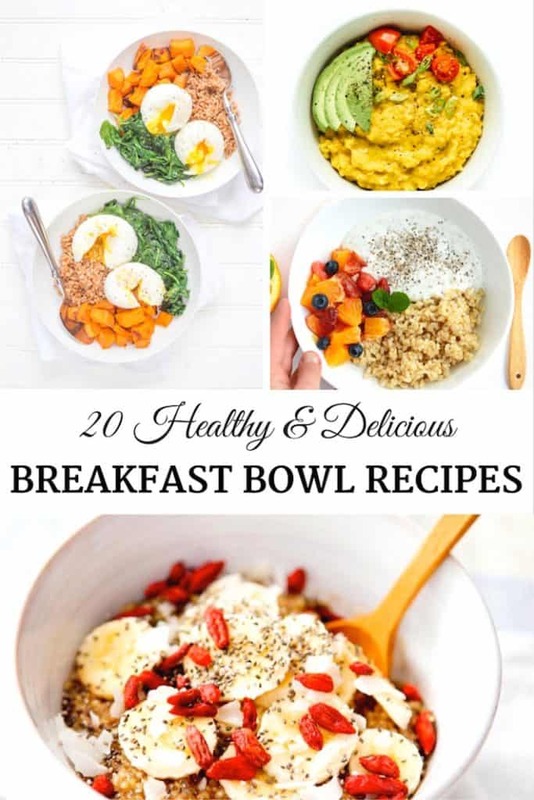 I’ve gathered a round up here of 20 delicious breakfast bowls with recipes for you…and for me to get around to trying to prepare as many as possible!